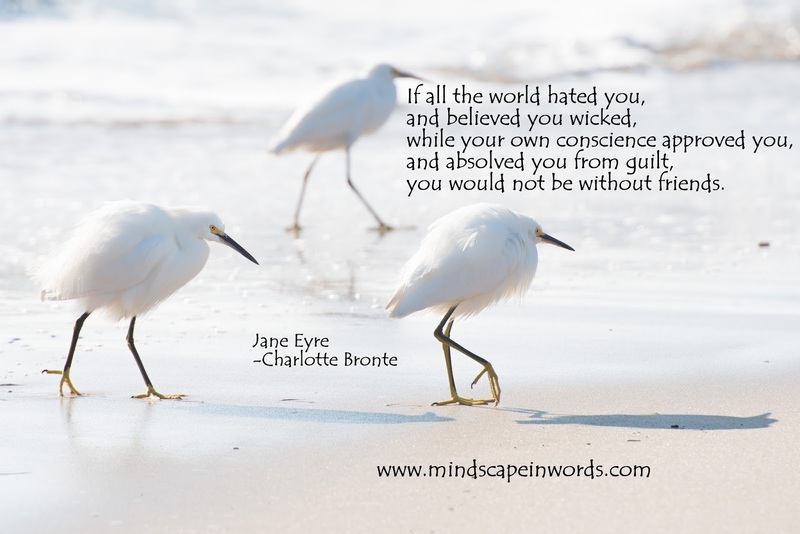 Jane Eyre is that novel which tops every must-read list that exists in those articles we read when we are in reading slumps. Be it about best classics or books about young love or books about a strong female character/feminism or an unputdownable story. I usually find it quite difficult to read classics due to various reasons... Old English. Slow story line. Spoilers. Longevity. Sheer amount of time it takes to finish those. I can go on. But, Jane Eyre caught me off guard. It completely surprised me. It not only got me out of my reading slump, but also made me fall in love with classic literature! Even though I read it at my own pace, I stuck by it without losing interest and managed to finish it. I was blown away by Jane's character. I loved how the story was plotted. I imagined what it would have been like to live in that era. I wasn't so happy with the ending, but, all in all, I gave it a 3/5 stars on Goodreads. 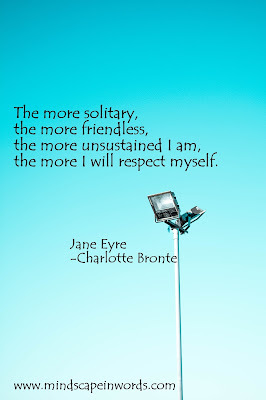 So, anyway, here goes an overall review on Jane Eyre! 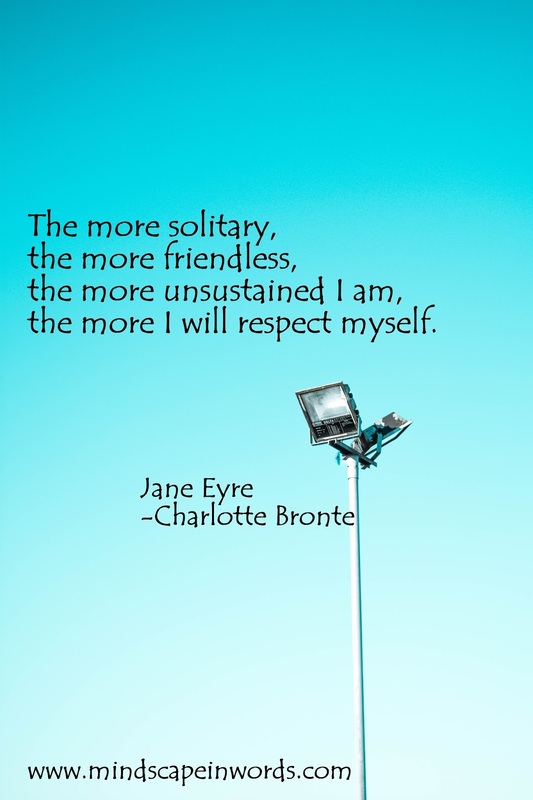 Since Jane Eyre is something that mostly everyone has already read, I won't go into my usual way of reviewing it. 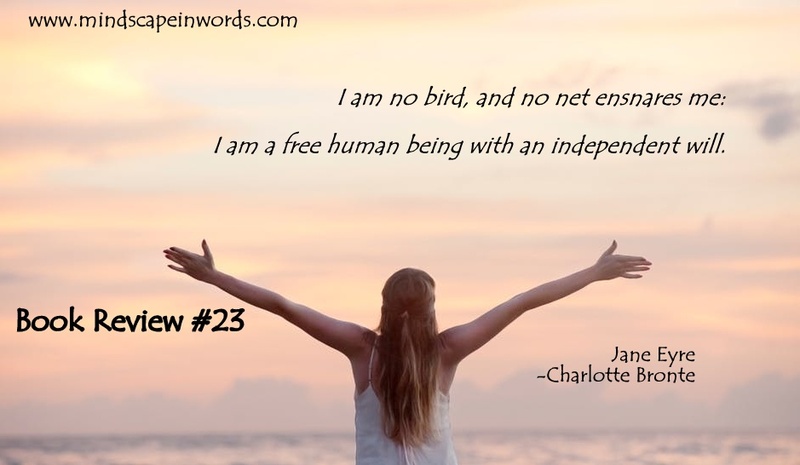 I'll skip the details of introduction and the story and tell you all about how lovely I thought the characters were marked out, about Charlotte Bronte's beautiful writing, some things I disliked and some breathtaking quotes from the book! From where shall I begin describing Jane? I could see her change throughout her journey, and maybe it was also because I also changed because of her, in some way. She started off a naughty child to become a well-educated young girl, only to fall in love with the wrong man. She was brilliant. She had educated judgements about everything at a time where women weren't really allowed to have an opinion, I suppose. She set a remarkable tone for ladies, about wisdom, opinion and art. She was practical and yet did not come across as cold-hearted. She was ordinary and yet came across as ambitious. She was simple and yet she became legendary in everything she did and by simply how she lived. Mr. Rochester, appeared to me, that kind of class-A man who had to tend to all these responsibilities just because he had to. Like, calling in guests once in a while, just because of customs. He was uptight and he had to maintain some kind of status, like he was living a whole superficial life until he met Jane, when he realised that life had more to it than what he had lived so far. With her simplicity of spoken thought, she unraveled his life like an open book and made him realise what was actually mattered. To be honest, I don't think there would've been his sort of character, if it weren't for a person like Jane to give him the highlight. Sometimes, you just have to create terrible people, so that good people come along to change them. The story was poetic. A timid girl without a family is left at a strict school where she is disciplined and gets moulded into a fine young lady. She learns a lot at a school where things could have gone either way for someone like her. Her personality is formed and we get to love how marvelous she becomes. And then soon she gets a job and a man enters her life; Mr. Rochester. Against all odds, they fall in love. But, just before getting married she understands that he is already married to a lunatic woman. Since he hides this fact from her, she decides to leave him. (Bravo on that Jane!) She goes somewhere far away. Finally after days, she finds a roof and some kind people. Later on, she starts to teach in a nearby school. If you ask me, this is where the story should have ended. But, no. People like happy endings and closure. So, somehow, Jane goes and finds Mr. Rochester only to know that he became blind and oh that should be a good revenge for what he did to her. So, in the end, she decides to stay with him. I won't tell you about the people she stayed with when she went away because these details are really not necessary here. Anyway, my point is, I understand it's a classic and things are supposed to happen in a certain way, but I was really disappointed about the ending. The entire strong built up of Jane's character was diminished, and what for? But, love! "She was the change that he needed. But, he became the change she did not need." 1. I stood lonely enough, but to that feeling of isolation I was accustomed, it did not oppress me much. 2. It was not the power to be tranquil which had failed me, but the reason for tranquility was no more. 3. Presentiments are strange things! and so are sympathies, and so are signs; and the three combined make one mystery to which humanity has not yet found the key. 4. You must have music, dancing, and society—or you languish, you die away. 5. I like you more than I can say, but I'll not sink into a bathos of sentiment. 6. Feeling without judgement is a washy draught indeed; but judgement untempered by feeling is too bitter and husky a morsel for human deglutition. I haven't read this book in a long time, so it was nice to be reminded of the story. I like how you did the review, by talking about the characters and the gist of the story. 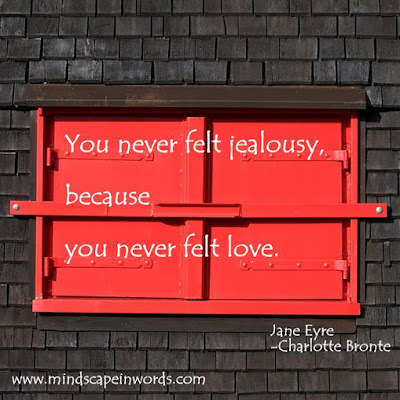 I read Jane Eyre in high school. I really enjoyed it and loved the character of Jane. But, I totally agree that it kind of just dragged on. I haven't read this book in so long that truthfully I forgot what happened. I do remember being disappointed in the ending. Jane Eyre is one of the best female novelists of her time and Jane Eyre is one of those books which I feel everyone should read! Just That Kind of a Poem.